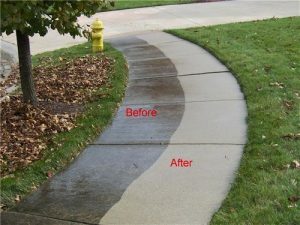 Indianapolis concrete cleaning can cause your concrete surfaces to not only look better but also serve you much longer before they begin to crack and deteriorate. Concrete is porous and absorbs pretty much anything that is put on it. Salt, rain, snow, and oil absorb right into the surface of the concrete and can cause cracking, splitting, and chipping of your very valuable concrete surface. When water gets between the cracks, it freezes and expands and makes a larger crack. 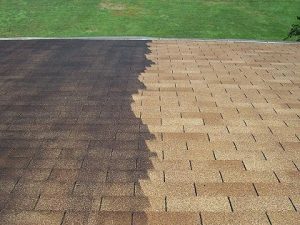 Mold and algae can set up in the pores as well and will turn your driveways and sidewalks all types of interesting colors. At Indianapolis Power wash, we recommend that first we clean your concrete surfaces(driveway, sidewalk, porch, pool deck, etc.) with our adjustable high pressure spray and algae killer. 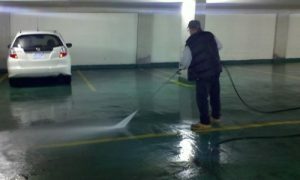 When we have gotten that grime off, let our team seal it with an invisible penetrating concrete protection. This stops contaminants from absorbing into the concrete surfaces. A sharp looking driveway can certainly raise the value of your home when it comes to selling your real estate. No one wants to buy a home that looks like it has been neglected. Call the pros at Indianapolis Power Washing for a quote for your concrete surfaces today.